Google’s worldwide walkout was the latest public display of employee anger with the search engine company. The thousands of employees at more than 40 offices worldwide walked out of work for half a day on Thursday to protest how Google management has dealt with sexual assault, harassment and free speech issues. The move, which began in Singapore at 11:10 a.m., follows criticism of the company’s involvement in “unethical” projects and internal processes such as the company’s involvement with Project Maven in which the company’s developers resigned over the leaked Dragonfly project. Then there was the outrage about Andy Rubin’s $90 million exit package following claims of sexual harassment, uncovered by The New York Times. 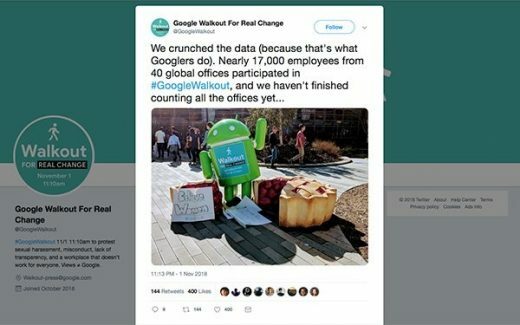 Organizers called it Google Walkout For Real Change. They demanded an end to forced arbitration in cases of harassment and discrimination, a commitment to end pay and opportunity inequity, a publicly disclosed sexual harassment transparency report, and a clear, uniform and globally inclusive process for reporting sexual misconduct safely and anonymously. The organizers also wanted to elevate the position of chief diversity officer to answer directly to the CEO and make recommendations directly to the board of directions, as well as appoint an employee representative to the board. The walkout’s organizers sum it up by writing that a company is nothing without its workers. They feel as if they are part owners in the company and responsible for the reflection they project onto the community and world. “Every person who walked out today is an owner, and the owners say: Time’s up,” the organizers wrote.